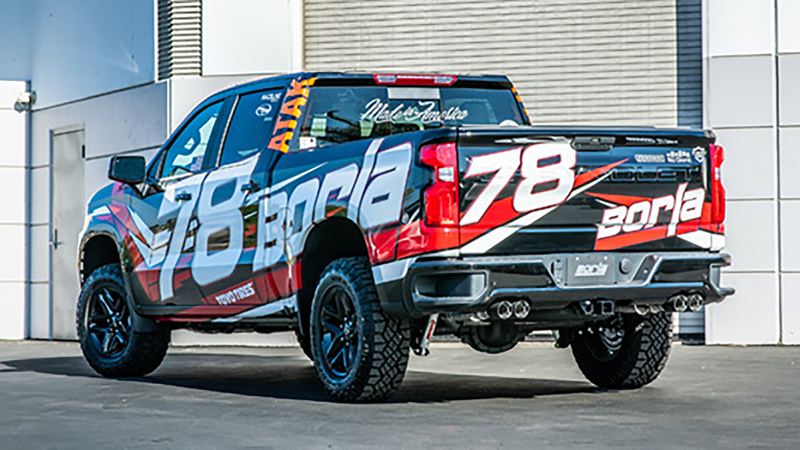 High end aftermarket exhaust manufacturer Borla makes a plethora of exhaust systems not only for vehicles from General Motors but for cars from a variety of automakers. The company gives customers options when it comes to adjusting the sound of their vehicle, producing exhaust systems for vehicles such as the Cadillac CTS-V, Chevrolet Corvette, and others. The company has announced its working on an all-new cat-back exhaust system for the 2019 Chevrolet Silverado 1500 and 2019 GMC Sierra 1500. The new exhaust system uses T-304 stainless steel construction and is available with a million-mile warranty. Yes, you read that right—one million miles, which is likely longer than the life of the vehicle. Not only is that a great marketing ploy, but it gives customers comfort that Borla products are made to last—or that they should last. The exhaust system is available on 2019 Silverado and 2019 Sierra pickup trucks equipped with either the 5.3-liter or 6.2-liter V8 engine. Customers will be able to choose from several different tips options and tip exist styles, which is a great way to personalize your vehicle. The exhaust will also have three available sound levels—Touring, S-Type, and ATAK. If your neighbors are of the disgruntled type, then choosing a tamer sound profile will likely keep the peace at the annual neighborhood cookout. Or, if you have a distaste for them, the ATAK sound profile should be enough in the morning to rile some feathers, if that’s your prerogative. Sadly, the exhaust system isn’t available yet. Borla says the parts are “coming soon” without offering pricing information. However, a quick search of the site shows exhaust systems for the previous-generation Silverado costing north of $1,000. You don’t want to buy the system until you hear what it sounds like, which is something Borla will likely compare itself, as it’s done before with exhaust systems for the Corvette, Camaro, and others. with states like calif. passing laws that any non stock exhaust systems are illegal. no more get it fixed you now pay a big fine and have to tow you vehicle home so how will this affect these exhaust companies ?? The quad tip does look good, but I actually like the faux trapezoidal exhaust tip ‘caps’ better. How can GM put such a cheap looking tailgate on a nice looking vehicle. And simply put a chev enblem on. 2020 Silverado has a new 401H.P engine . The pipes criss cross and have a flat spot because of it. Now what ?